Arrival garners a lukewarm welcome. Arrival is the kind of movie that generates an odd mix of admiration and frustration. There are great ideas and terrific thoughts that warm the heart. But there’s also a detachment, an arms-length stance that keeps the characters and story at a distance when they all desperately need to be snuggling up right in the audience’s lap. Noble and numbing. High-minded and open. Bold and dull. Technical and creative. Those diametrically-opposed sensations are also a reflection of the story itself, which questions whether science or language is the foundation of civilization. Aliens have arrived on Earth. There are 12 gigantic spheroids hovering over land at various locations around the world. Communicating with the aliens is a challenge. Nobody speaks their language and nobody has a clue how to engage them. It’s a close encounter of the uncertain kind. Naturally, such a scenario leads to scenes of politics and panic. China and her allies bandy around talk of military action against the uninvited guests. The streets of Venezuelan cities erupt in looting and riots. And then there’s Louise (Amy Adams, Big Eyes), a linguistics expert who’s already proven her worth on previous military missions. She translated insurgent communications and then the military quickly snuffed out the insurgents. Based on Ted Chiang’s Nebula Award-winning novella entitled Story of Your Life, the movie begins with Louise and focuses on her close relationship with her daughter. Doing so provides the basis for a storytelling twist that requires viewers to step back and think about a comment Louise makes much later in the movie. This element is the crux of the movie and the degree to which one buys into this “big idea” will certainly determine how much the movie overall is appreciated. In short, Louise writes a book based on her work with the aliens and in it she espouses the value of communication. Her concept goes so far as to describe language as having time-bending properties. Sounds great in a figurative sort of way, but it’s a tough notion to swallow in the more literal sense the movie’s story arc tries to take it. There’s no doubt the movie’s ambitions are laudable. However, there’s a lot that simply has to be accepted at face value in order for the story to work its magic. The biggest narrative challenges fall in line with the semi-disastrous M. Night Shyamalan movie Signs. In that one, aliens come to Earth — reminder: two-thirds of our planet is covered in water — only to find out water is Kryptonite to them. It was a poorly-concocted play on H.G. Wells’ War of the Worlds. 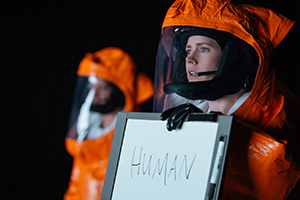 Here, questions surround some of Arrival’s logic as well. They are questions worthy of post-movie discussions in cozy cafes and not so much the derisive sort Signs invited. Nonetheless, they provide the undercurrent of frustration that rails against the admiration. It’s established there’s a need to teach English to the aliens and to learn the aliens’ logogram language. It’s also established the aliens came to Earth in order to help us. Awesome. The world needs all the help it can get. But, if they don’t speak our language, what were the signals indicating we needed their help? Maybe we’re a crazy race that thrives on chaos. Maybe we’re all about the survival of the fittest. And if communication is so precious, why would the aliens be so insensitive as to refer to language as a “weapon,” which naturally triggers the trigger-happy? If they know we’re on edge, that’s not helping matters. Sure. It’s a forced-collaboration scenario. The world needs to work together in order to gain an understanding of the new foreigners. Star Trek Beyond ventured into that “collaborate or die” turf during the summer. And it’s a notion that’s well-timed in light of today’s tense geopolitical atmosphere. Still, it’s a long, plodding two-hour journey that arrives at a destination of debatable value. Curious and indifferent.